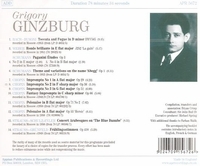 "Grigory Ginzburg (1904-1961) was perhaps the most astounding virtuoso to emerge in Soviet Russia and it is a tragedy that he was never allowed to travel to the west after the mid 1930s. He focused his repertoire very much on the 19th century Romantic period and, above all, in Liszt, and his prolific recordings include many of Liszt's virtuosic opera paraphrases that had fallen into neglect. This CD is the second of two devoted to his earliest 78rpm recordings mainly dating from the 1940s. These discs are extremely rare and many of the performances included will be unknown to even the most ardent collectors."